The ARRadio-HSMC is an HSMC board for the AD9361, a highly integrated RF Agile Transceiver™. While the complete chip level design package can be found on the the ADI web site. Information on the card, and how to use it, the design package that surrounds it, and the software which can make it work, can be found here. The purpose of the ARRadio-HSMC is to provide an RF platform to which shows maximum performance of the AD9361. 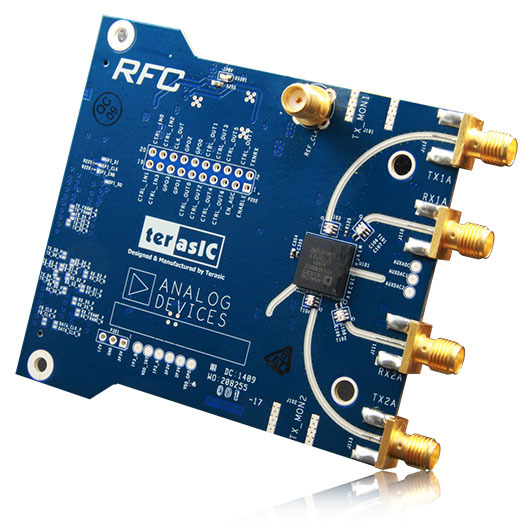 It’s expected that the RF performance of this platform can meet the datasheet specifications without issues at 2.4 GHz, and not much anywhere else. This is due to the external Johanson Technology's 2450BL15B050E 2.45 GHz Balun that is on the board. This balun is rated for a operating frequency of 2400~2500 MHz.